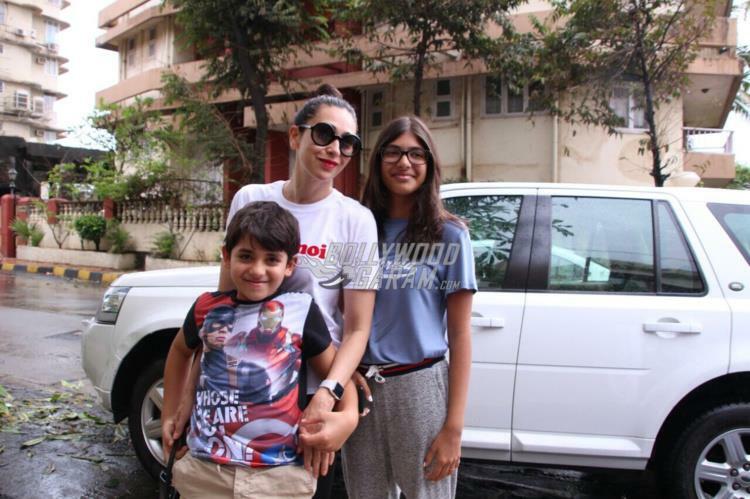 Actress Karisma Kapoor is these days often photographed spending most of her time with her children Samiera and Kiaan. The Andaz Apna Apna actress was photographed on a casual outing with her kids and was all smiles and poses as they were photographed by the shutterbugs. Karisma even a few days back was seen with her children spending time at a restaurant. Karisma looked fresh and pretty in a white t-shirt and track pants while daughter Samiera, who is a big girl now was all smiles and was seen in a casual t-shirt and track pants. Kiaan was at his naughty self as he was held by his mother. Karisma is separated from husband Sunjay Kapur, who is now married to Priya Sachdev. Reports say that it was due to Sunjay’s extra marital affair with Priya that led the a divorce between the two. Karisma and Sunjay’s divorce affair had taken an ugly turn but a conclusion was drawn and was finalized in 2016.